Global antimicrobial coatings market size is predicted to be valued at over USD 7 billion by the end of 2024 as a result of its applications in textiles, indoor air quality, medical & healthcare, mold remediation, construction, and food packaging. It is used in medical devices, constructions, and vehicles to help in preventing the microorganism growth on its surfaces. All these factors are projected to promote the industry growth trends. Antimicrobial coatings industry size worth over USD 3 billion in 2017, is anticipated to register a CAGR of around 12.5% over 2018-2024. Its strong applications in the medical device and healthcare sector to prevent hospital acquired infections is predicted to drive the market growth. Application of these products in the construction sector owing to its property of reducing indoor air pollution over a long period will support the growth of the global antimicrobial coatings market. Antimicrobial coatings industry is segmented in terms of products, applications, and regions. 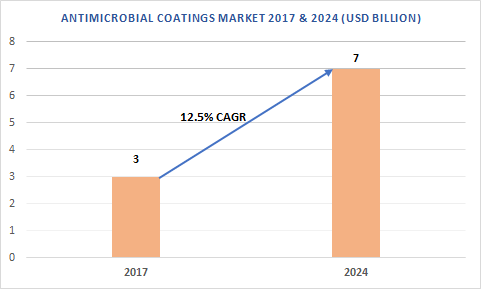 Surface modifications & coatings segment worth over USD 1.5 million in 2017, is predicted to witness a noticeable growth over the forecast timeline due to its adhesion features, prolonged stability, and ability to combat E. Coli bacteria -a root cause of human infection. Antimicrobial powder coatings market is predicted to grow at a rate of around 10% over the forecast timeframe as a result of its applications in medical, steel & furniture sectors as well as in domestic appliances. It also finds application in sterilizing equipment, refrigerators, hospital beds, kitchen sinks, escalators, steel storage cabinets, elevators, and kitchenware. 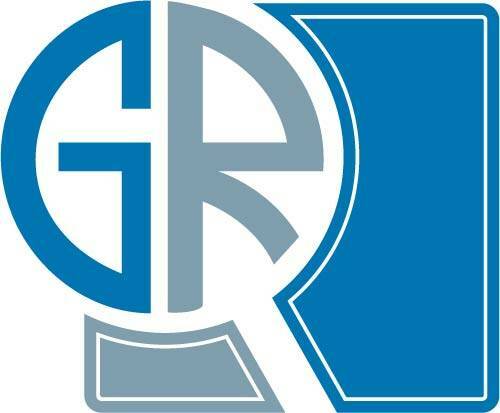 Mold remediation applications segment is anticipated to produce highest gains exceeding a revenue of over USD 1.1 billion by the end of 2024 as a result of a rise in mold production. Indoor air quality applications segment is predicted to witness a substantial growth over the forecast timeframe. The growth can be attributed to strict norms introduced by the U.S. and Europe to enforce the use/application of the antimicrobial coatings in hospitals and schools to avoid infections. Medical & healthcare applications segment is anticipated to grow at a rate of around 9.5% over the forecast timeline. Coating of medical devices in order to avoid fungal or bacterial growth and rise in the number of clinics in the U.S. and Europe will promote the segment growth over the forecast timeframe. Asia Pacific antimicrobial market is anticipated to grow at a CAGR of around 9.5% over the period of 2018-2024 due to its heavy demand in construction activities in China, Thailand, Malaysia, South Korea, and India. North America market driven by food applications segment, is predicted to witness a significant growth over the forecast timeline owing to strict FDA norms and rising health concerns. U.S. antimicrobial coatings market worth over USD 950 million in 2017, is anticipated to record a substantial growth over the period of 2018-2024 due to enhanced medical facilities and healthcare infrastructure. Europe antimicrobial coatings market is predicted to exceed USD 1.4 billion by the end of 2024, with a CAGR of around 7.5% over the period of 2018-2024. The growth can be attributed to factors such as flourishing food industry coupled with improved healthcare facilities in countries like Italy, UK, France, and Germany. MEA antimicrobial market is projected to witness a significant growth over 2018-2024 with a rise in construction activities and improved medical amenities in countries like Qatar, Saudi Arabia, and UAE. Latin America is predicted to witness a substantial growth, with Brazil mold remediation antimicrobial coatings market anticipated to register around 9.5% CAGR over the forecast timeline. Factors such as infrastructure development along with strict norms regulating the use of volatile organic compounds (VOC) are predicted to contribute towards the growth over 2018-2024. Key industry participants profiled in the report include DuPont, Nippon Paint, AzkoNobel, Troy Corporation, Sono-Tek Corporation, and BASF. These industry players are focusing on enlarging their product portfolio to increase their market share by adding low VOC products.